In this lesson, we will learn how to use the conservation of momentum principle to solve problems involving inelastic collisions in which a deformation takes place. A ball of mass 3 kg, moving in a straight line at 32 cm/s, collided with another ball of mass 2.5 kg that was at rest. Given that the two balls coalesced into one body, determine the speed of this new body. Two smooth spheres of masses 83 g and 37 g were moving in a straight line. At time 𝑡 seconds, where 𝑡 ≥ 0 , the spheres’ displacements relative to a fixed point are given by ⃑ 𝑠 =  ( 1 6 5 𝑡 ) ⃑ 𝑐  1 c m and ⃑ 𝑠 =  ( − 1 9 5 𝑡 ) ⃑ 𝑐  2 c m , respectively, where ⃑ 𝑐 is a fixed unit vector. Given that the two spheres collided and coalesced into one body, determine the speed 𝑣 of this composite body and the magnitude of the impulse 𝐼 between the spheres. A builder is hammering nails into a wall. The hammer has a mass of 3.3 kg, and each nail has a mass of 308 g. Given that the hammer hits each stationary nail at a speed of 8.2 m/s, use the principle of conservation of momentum to find the speed of the hammer and nail directly after the impact. Two spheres, 𝐴 and 𝐵 , are moving in a straight line on a smooth horizontal plane in opposite directions at 7.17 m/s. If their masses are 4 𝑚 and 8 𝑚 , respectively, find the velocity 𝑣 𝐴 𝐵 of sphere 𝐴 relative to sphere 𝐵 . Given that the two bodies coalesce on impact into one body, find the speed 𝑣 of this new body just after the collision. A ball of mass 60 g started accelerating from rest at 7 cm/s2. At the same moment, another ball of mass 40 g, which was 450 cm ahead of the first ball, started moving in the same direction as the first ball at a constant speed of 90 cm/s. Then the two bodies collided and coalesced into one body. Find the speed of this body directly after the collision. Two smooth spheres, 𝐴 and 𝐵 , of masses 160 g and 40 g, respectively, are moving in opposite directions along a horizontal straight line. Sphere 𝐴 was moving at a constant speed of 95 cm/s, and sphere 𝐵 was initially moving at 75 cm/s while accelerating at 5 cm/s. After sphere 𝐵 covered a distance of 340 cm, the two spheres collided and coalesced into one body. Determine the speed of this body right after the collision. A sphere of mass 28 g was moving horizontally in a straight line at 319 cm/s when it collided with another sphere of mass 30 g which had been at rest. If the spheres coalesced into one body as a result of the impact, and the body continued moving under the influence of a constant resistive force of 29 g-wt, determine the distance it covered after the collision until it came to rest. Consider the acceleration due to gravity to be 𝑔 = 9 . 8 / m s 2 . A body of mass 0.6 kg, moving in a straight line at 33 cm/s, crashed into another body of mass 0.5 kg that was at rest. If they coalesced into one body, and this new body moved 20 cm before it came to rest, find the magnitude of the force resisting this body’s movement assuming that it was constant. A ball of mass 125 g moving at a constant speed of 50 m/s passed a certain point and, 3 minutes later, another ball of mass 75 g passed the same point. It was moving at 80 cm/s and accelerating at 4 cm/s2. The two balls collided and coalesced into one ball. Determine the time 𝑡 taken for the second ball to hit the first and the speed of the coalesced body after the impact. Two spheres are moving along a straight line. One has a mass of 𝑚 and is moving at speed 𝑣 , whereas the other one has a mass of 10 g and is moving at 36 cm/s. If the two spheres were moving in the same direction when they collided, they would coalesce into one body and move at 30 cm/s in the same direction. However, if they were moving in opposite directions, they would coalesce into one body which would move at 6 cm/s in the direction the first sphere had been travelling. Find 𝑚 and 𝑣 . On a smooth plane inclined at to the horizontal, is a line segment parallel to a line of greatest slope of the plane. The point is at the top of the plane, and the distance between and is 7 m. A sphere of mass 45 g was left to roll down the plane from the point . At the same moment, another sphere of mass 165 g was projected up the line segment from point at 7 m/s. Given that, when the two spheres collided, they coalesced into one body, find the speed of this combined body and the maximum distance that the body will move up the plane after the collision stating the answer to the nearest two decimal places. Consider the acceleration due to gravity to be . A railway carriage of mass 11 tonnes started moving down a plane from rest. The plane was inclined to the horizontal at an angle whose sine is 1 5 0 , and the resistance to the carriage’s motion was 16 kg-wt per tonne of the carriage’s mass. The carriage reached the bottom of the plane after covering a distance of 144 m, and then it collided with another carriage of the same mass that was at rest. Given that the two carriages coupled together as a result of the impact then came to rest 50 seconds later, determine the distance covered by the two carriages on the horizontal road. Consider the acceleration due to gravity to be 𝑔 = 9 . 8 / m s 2 . A body of mass 5 kg was moving at 18 cm/s when it collided with another body of mass 1 kg moving at 27 cm/s in the opposite direction. The two bodies coalesced into one body. Then, this body collided with a third body of mass 12 kg which was at rest. As a result, this body coalesced into the other, forming one body from all three. Find the speed of this last compound body after the collision. Three smooth spheres 𝐴 , 𝐵 , and 𝐶 of masses 430, 140, and 840 grams, respectively, were placed on a smooth horizontal table along a straight line such that 𝐵 lies between 𝐴 and 𝐶 . Sphere 𝐴 was projected at 57 cm/s towards 𝐵 . When they collided, they coalesced into one body that kept moving towards 𝐶 . When this new body collided with 𝐶 , it rebounded at 6 cm/s. Find the speed of sphere 𝐶 after the impact. A sphere of mass 68 g was projected along a rough horizontal plane at 23 m/s. The resistance to the motion of the sphere was 1 1 4 of the sphere’s weight. Then, 10 seconds later, it collided with another sphere of the same mass moving at 18 m/s in the opposite direction. As a result of the collision, the two spheres coalesced into one body. Calculate the speed of this new body immediately after the impact. Take 𝑔 = 9 . 8 / m s 2 . Two projectiles of the same mass of 50 kg were fired at 44 m/s towards a target of mass 400 kg that was moving away from the projectiles at 11 m/s. Both projectiles hit the target and sunk into it. This combined body was then hit again from the opposite direction by another projectile of mass 220 kg. Given that this body also coalesced with the target and, as a result of the impact, this new body came to rest, determine the speed of the last projectile which hit the body. A mechanical hammer of mass 632 kg fell from a height of 2.5 m onto a body of mass 474 kg. As a result, the body penetrated 20 cm into the ground. Immediately after the impact, the two bodies moved together with the same speed 𝑣 . Given that the acceleration due to gravity is 9.8 m/s2, find 𝑣 , and determine the resistance 𝑅 of the ground. A body of mass 1.8 kg was projected vertically upwards from the ground at 14.7 m/s and 1 second later, another body of mass 2.7 kg was projected vertically upwards from the same point at 18.9 m/s. The two bodies collided and they coalesced into one body. Find the maximum height this compound body reached above the ground. Consider the acceleration due to gravity to be 𝑔 = 9 . 8 / m s 2 . A body 𝐴 of mass 50 g was falling vertically at 120 cm/s when it collided with a body 𝐵 of mass 40 g moving vertically upwards at 700 cm/s. Body 𝐵 rebounded vertically downwards at 140 cm/s, whereas body 𝐴 rebounded vertically upwards. Then, 1 7 of a second later, body 𝐴 collided with another body, 𝐶 , of mass 300 g moving vertically downwards at 15 cm/s. The two bodies coalesced into one body, and the body continued moving. Find the speed of this compound body after the second collision. Consider the acceleration due to gravity to be 9.8 m/s2. Two spheres of masses 40 g and 10 g were moving in a straight line towards each other at 45 cm/s and 30 cm/s, respectively. When the two spheres collided, they coalesced into one body. Determine the kinetic energy lost as a result of the impact in ergs. Two bodies of masses 861 g and 287 g were moving towards each other along the same straight line at 8 m/s. Given that when the two bodies collided, they coalesced into one body, determine the speed of this new body. Two spheres of masses 110 g and 275 g were moving along the same straight line in the same direction at 55 cm/s and 90 cm/s, respectively. Given that they collided and coalesced into one body, find the loss of kinetic energy as a result of the impact. A bullet of mass 24 g was fired at 462 m/s towards a target of mass 1 kg which was at rest. After the impact, the target and the bullet moved together as one body. Given that it came to rest after covering a distance of 105 cm, determine the resistance to the body’s motion, assuming that it was constant. Two spheres were projected one after the other along the same straight line and in the same direction. The mass of the first sphere was 230 g, and its speed was 14 cm/s, while the mass of the other was 345 g, and its speed was 25 cm/s. Given that the spheres coalesced into one body when they collided, determine the speed of this compound body. A body of mass 9 kg was at rest on a rough horizontal plane. The resistance to the motion of the body was equal to 1 9 its weight. A horizontal force of 25 kg-wt acted on the body for 3 seconds. As soon as the force stopped acting, the body collided with another body of mass 5 kg which had been at rest, and the two bodies coalesced into one body. 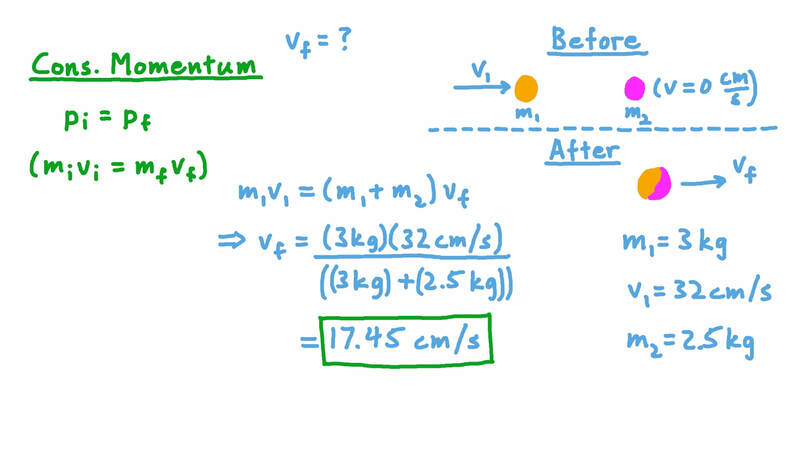 Find the loss in kinetic energy as a result of the impact. Consider the acceleration due to gravity to be 9.8 m/s2.